Our ancestors often gathered in a circle around hearth or fire to sing songs, share food, and celebrate community. That’s what SongSquad does! All ages, faiths, cultures, abilities, sexual orientations, and gender identities gather in a circle … to sing songs from around the corner and around the world … to share conversation and food with friends … and to experience the true meaning of harmony. We raise our voices together to share our untameable joy and our unnameable pain, connecting deeply to our truest selves, to each other, and to the more-than-human world. Our motto is: Paperless singing in a perfection-free zone! A fun and judgement-free environment welcomes everyone. There are no auditions, all songs are taught by ear, and no singing experience or music reading ability is needed. See our LEARN SONGS page. Siblings Pam Blevins Hinkle and Adam Blevins have shared a lifelong love of music-making, from the sublime to the silly. Pam believes that singing together is MAGICAL and a critical ingredient for individual and community health. Pam has over 25 years experience leading college, community, and congregational choirs and she is certified by the Community Choir Leadership Training Program of the Ubuntu Choir Network. Read more on Pam’s website and find many of her compositions on the LEARN SONGS page. Adam is a singer, guitarist, songwriter, and song leader who is passionate about helping people (re)discover their musical heart. He is driven to help people strengthen their voice in the world (singing or not), and to bring the joy of collective singing to people of all ages and abilities. See our Facebook page for detail on all events listed below. Sat., October 13, 11am-1pm, Garfield Park Art Center, 2432 Conservatory Dr. Sat. November 10, 10am-noon, Riverside Park Center, 2420 E. Riverside Dr. Sat., December 1, 11am-1pm, Garfield Park Art Center, 2432 Conservatory Dr.
Visit our Facebook page for upcoming appearances. We’ve led both small and large crowds in singing at events ranging from the Women’s March in Indianapolis to the Concert for Social Change at the Madame Walker Theatre Center. Want SongSquad at your event? Contact us! 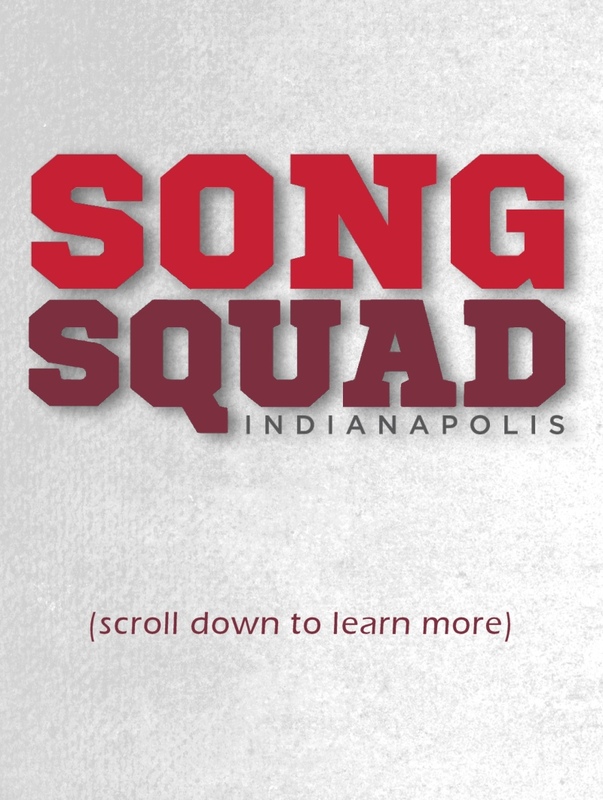 Want information on joining or booking Song Squad? We’d love to talk to you. Just use the form below to email us. You can also get in touch with us via Facebook. Click here for Squadron Access. Indiana Arts Commission, a state agency.